Summary: It’s wet now. It’s going to be on-and-off wet all week. Looking at a *chance* of severe weather chance later this week. This morning, we are starting our weeks wet with heavy downpours and some rumbles of thunder as this rain moves though. 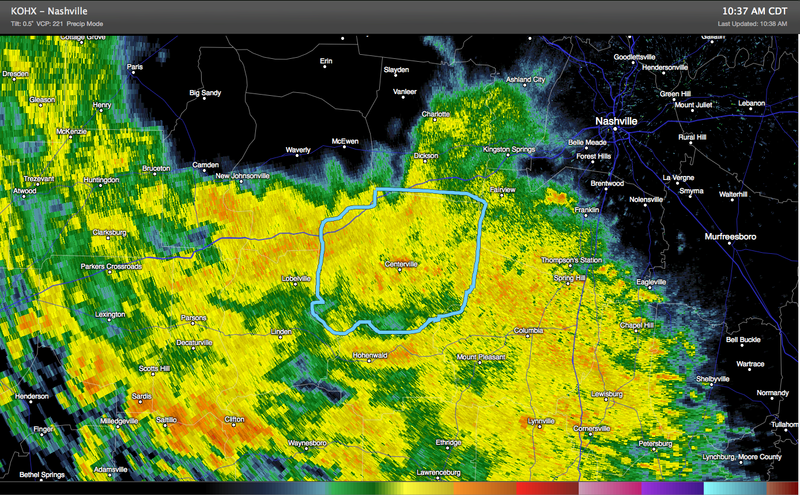 Here’s the current radar as of 10:37am. This is how most of the day will be this morning and early afternoon, turning into a spotty chance of rain later this afternoon and evening. Our high is expected to be 68 degrees. Our chance of rain today is virtually 100%. 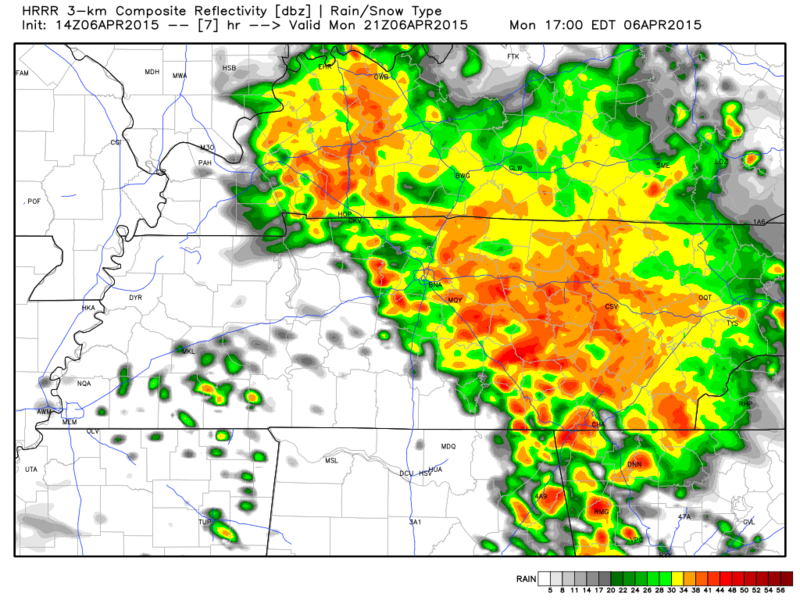 The current rain should break up about 4pm for us, according to the HRRR model. After that, spotty chances of rain will be in the forecast for the rest of the night. Tonight’s low will be about 62 degrees, so not much movement in the temperature for the next 24 hours. The rest of the workweek will be soggy, too. Today is a bit of a taste of what is expected this week. Tuesday, Wednesday, and Thursday hold a smaller rain chance at 30%, with high temperatures in the lower 80’s. Thursday night and Friday, however, our rain chances increase quite a bit. It is expected that another cold front will move through, setting of an increased chance of storms with possible severe weather Friday. 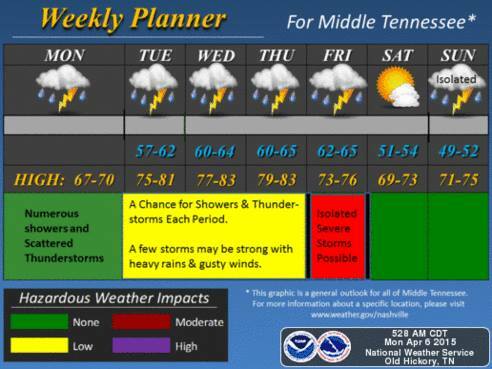 Here’s NWSNashville’s graphic outlining this week’s weather. 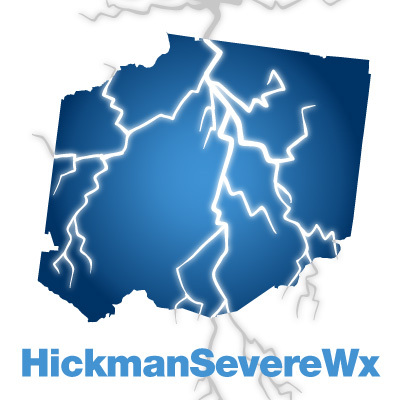 They mention a chance of isolated severe storms on Friday. The SPC currently doesn’t have us outlooked for severe weather Friday, however, they have produced the following graphics for Thursday and Friday. Friday: The severe weather chances skip over Tennessee in the official outlook, but since we are sandwiched in between, and storms in the US generally come from the west to the east, it is safe to say that whatever happens in Missouri and Arkansas will come through here first before going to the Carolinas and Virginia. It’s something we will watch but with four days before the event, lots can change.